The Avaya 9611G IP phone is one of the mid range models in the large 9600 IP series lineup. It’s designed with heavy phone users in mind and is one of the most popular Avaya IP models with it’s Gigabit connectivity and colour screen for enhanced visibility. For more information about the 9611G phone please read below. Incredibly, there is another 8 models above the 9611G IP phone. The reality is though the only other models you'd look to for most staff might be the 9621G, the 9620L or the 9620C. All are a step up in price and the only reason you would even look at the 9620L IP or 9620C IP is if you want different colour handsets. The 9621G by comparison offers a bigger colour screen, a touch screen, a POE class 2 solution, and no extra USB interface (although still has 2nd Ethernet line interface anyway). Avaya describes all the aforementioned IP handsets as suitable for the essential or everyday user. The Avaya IP models up from these three become somewhat tenuous for most. You start getting different colour handsets, bigger screens and the choice of custom faceplates and Bluetooth integration. We suggest you look at the comparison chart at the bottom of the page to work out what's best for your own requirements. The 9611G is a very easy to use handset with large display and everything is clearly visible. The "G" in various models denotes the integrated gigabit support. If you want to go for cheaper handset in your deployment then the 9608 or the budget 1600 series IP phones would be where you should look. The Avaya 9611G IP handset comes with Avaya's wideband audio technology to offer a premium sound user experience (as opposed to narrowband). Without wideband, on handsets or headsets for that matter, IP telephony can sound slightly less natural as the audio frequency range is suppressed. Just because we're talking telephones, don't think the focus in on only sound quality. An intuitive colour display means you can navigate the 9611G functions easier than the monochrome handsets on some other IP models. Furthermore, the 4 softkeys under the screen are context sensitive and depending on which function you are performing (making a call, accessing voicemail etc) it will then display the most logical options for you. Next to the large 9611G screen there are 8 buttons (4 either side) these offer multi colour green/red LED lights that show the status of the items on screen. Users can customise these buttons to show staff, phone lines as well as other features. You can also toggle down the screen 3 times in total to show the equivalent of 24 unique programmable buttons. If you find that you need to see more than 24 items you can add an optional 12 button DSS console with LCD screen to provide 96 programmable buttons in total. In a typical IP rollout the Avaya 9611G IP phone normally makes up the bulk of handsets in a gigabit environment rollout. The cheaper 9608 is a better choice for companies operating 10/100MB environments. Whichever IP handsets you choose you can also mix and match from any IP or phone handsets including the cheaper 1600 IP series. If you're looking for a virtually identical but less expensive- non-IP version of this phone, check out the popular 9508 digital phone. 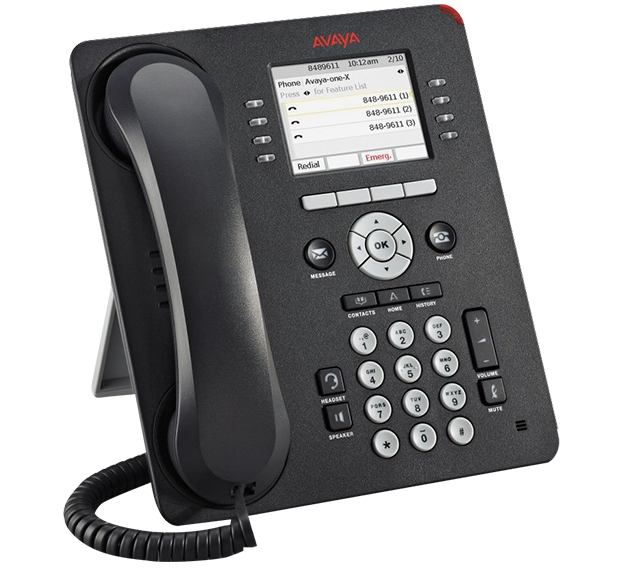 Like all IP handsets, the Avaya 9611 IP phone allows you to plug it into any Ethernet port that is connected to the Avaya IP Office 500 pbx and be automatically registered. This makes staff moves and changes very easy as you simply plug the 9611 handset in and login. It then carries forward your extension with you and all personal preferences and programming. Furthermore, if you have interstate or remote locations a user can grab an available IP handset and simply login. It will then present as their phone and away they go - just like they were sitting at their normal desk with their normal extension number and features. To experience the Avaya 9611G IP handset firsthand, give our friendly staff a call today and arrange a no-obligation demonstration. We look forward to showing you how an Avaya IP phone system can transform your business.